Janice Wainwright is suing her doctor for messing up her back during surgery, and private detectives Sam Blackman and Nakayla Robertson have been hired to follow her to see if she does anything that indicates she's not really hurt. They follow her to the top of Glassy Mountain where she falls down, hits her head and dies ~ just around the corner, out of their sight. What really happened to Janice? Did she just trip or did someone hiding in the trees push her? And what do her dying words, referring to Carl Sandburg's verses, mean? The Sandburg Connection by Mark de Castrique is a fun detective mystery with interesting characters and a unique literary tie-in. Once Janice dies, Sam and Nakayla switch over to helping her daughter uncover what really happened to her. They dig into her historical research, trying to determine if someone was after whatever she was researching. They investigate the surgeon to see what he might be hiding. They even consider the possibility that her own daughter could have pushed her down. There are plenty of characters that could have been involved, and there's always that chance that Janice really just fell. This kept the pages turning as I wanted to know what was really behind her death. Intertwined with the mystery of her death is the history of Carl Sandburg's home near Glassy Mountain and the songs he collected, the Confederate army's history in the area, and a goat that is about to give birth. Yes, really. There is actually quite a bit of true history and humor weaved into the story, which kept it interesting, lighthearted and fun. Evidently there are two other Sam Blackman novels, but you definitely don't have to read those before reading this one. It stands alone, although I assume there is probably some history I'm missing between Sam and Nakayla. You also don't need to know much about Carl Sandburg prior to reading this. It was interesting to learn about him, though. 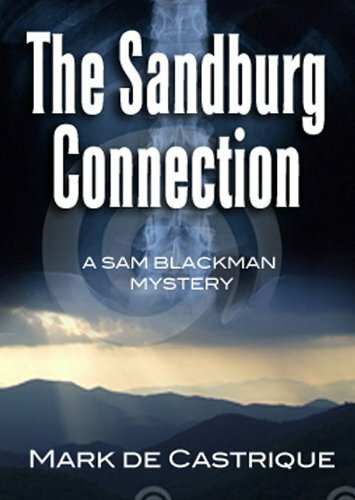 I recommend The Sandburg Connection if you're looking for a lighthearted mystery with a variety of unique characters and a literary slant. I'll likely check out some of the other Sam Blackman novels in the future. This review was written based on an ebook copy of The Sandburg Connection that I received from Poisoned Pen Press through NetGalley in exchange for an honest review.